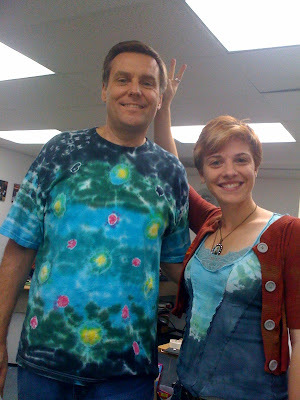 iLoveToCreate Blog: Our employees love tie dye! Our employees love tie dye! Check out Frank Peters (our R&D manager) and Lauren Binci (our new product development manager), hamming it up wearing their custom Tulip® One-Step Fashion Dye™ t-shirts in the office for casual Friday! Frank said Debbie (you may remember her from our post on Adam Lambert) made him the shirt. Debbie's always trying out new techniques and having fun with tie dye! Lauren is also very creative and whipped up a tie dye shirt, and then sewed her custom shirt using one of her corsets as a guide. We absolutely love seeing our employees wearing our products here at I Love To Create! Have you used our dyes or other products in a project recently and want to shout it from the rooftops? Leave a link to it in our comments section or shoot us over an e-mail at ilovetocreateblog@yahoo.com . We'd love to see what you love to create!